As in the majority of the drills, coaches should try to make the drills as “game-realistic,” as competitive, and as time-efficient as possible. Coaches should want to incorporate some offensive concepts and philosophies for one group of players to work on as another group within the drill works on developing specific defensive skills. This drill philosophy provides offensive as well as defensive teaching and practice during the same drill. 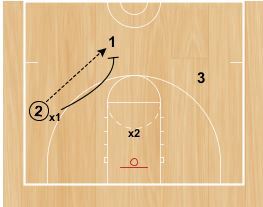 This drill can be a very effective breakdown drill for specific players to work on their particular transition responsibilities and assignments both defensively as well as offensively. 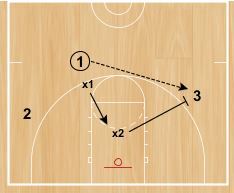 This drill can be set up primarily for the two most important players in a team’s defensive transition—the two defenders that are to be first in getting back on defense. Every player should work on these two defensive positions because any player can end up in one of those particular positions. While not disregarding the other players in this drill, the two players that should be the first main focal points of the coaching staff’s attention are the initial two offensive players that will quickly become the two defenders that are in transition offense to defense. They are players X1 and X2 in the following diagrams. The next focus is on the three offensive transition players that initially started on the defensive end. They are players O1, O2 and O3. During the next phase of the drill, the defensive focus is changed to the lone defender that goes back to the defensive end. This could be either O1, O2 or O3. During the same phase of the drill, the offensive focus is centered on X1 and X2 as they come down the floor in a 2-man offensive fastbreak. If an offensive team shoots, misses, and surrenders a defensive rebound; there are two assigned positions for the first two defenders who are to get back on defense to protect their basket. If the offensive team loses possession of the ball via a turnover, there are no definite defensive transition assignments–it is simply imperative that the offensive team’s basket is immediately protected, regardless of who gets back first. That is the main reason that all players should be placed in these two positions with this drill. After the “Ball-Man” (X2 in Diagram 3) has stopped dribble penetration and influenced a pass to either wing, he must quickly drop to the weakside block area, as if he were defending a backdoor cut. That is, he would turn his back on the ball and face the weakside block area where O3 would most likely cut, looking down his extended right arm for the ball. The original “Basket-Man” (X1 in Diagram 3) should take the first and the second perimeter pass. The two wing players (O3 on the left and O2 on the right in Diagram 2 thru 5) should sprint out and get ahead of the ball, while constantly looking for the pass. When the cutting wings hit the free throw line extended, each should plant off of their outside foot, and slash-cut directly to the basket. The offensive team should try to keep the ball in the middle and get down the floor as quickly as possible, but under control. The dribbler (O1) should not anticipate that the defense will stop the dribble penetration and if not stopped, they should then attack the basket until someone does stop them. If and when the defense does stop the ball, that ball-handler should make a solid jump-stop and look to make a bounce-pass (below the outstretched arms of the defenders) to one of the cutting teammates. All offensive players should avoid offensive fouls as a result of out-of-control dribbling. All offensive players should remember to “take what the defense will give you” and not force the action. When the three offensive players (O1, O2, & O3) lose possession of the ball because of a made shot, a missed shot, or a turnover; either the shooter or the player who committed the turnover must turn and sprint back to protect the far basket by himself. The original two defenders (X1 & X2) would then sprint back and run a two-man offensive fastbreak against the new lone defender. (In this case, the lone defender is O3). The new lone defender works on his defensive techniques as a solo defender against the two offensive opponents trying to score an easy basket against his transition defense. Not worry or sulk about the missed shot or the turnover. Both players should sprint quickly down the floor as quickly as possible, under control and looking for defenders as well as the basketball. Offensive players should not make a decision too early on what they are going to do with the basketball-they should have an idea-but read the defense and take what the defense will give to them. Offensive players should remember that “rebounders jump while passers stay on the ground”—offensive players should not leave the ground to pass and get lured into an offensive foul, especially when there is an offensive numerical advantage. Offensive players should look to make bounce passes to teammates that are close to the basket, because those type of passes are more difficult for defenders to deflect or intercept. 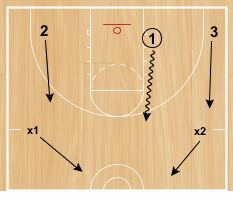 This drill works on specific techniques for the defensive transition as well as the offensive transition. 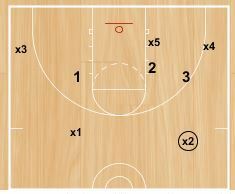 Offensive fundamentals such as passing, catching, dribbling, running, shooting, and quickly getting back on defense are incorporated in this drill on a fast paced full-court scale. Defensive fundamentals such as stopping dribble penetration, guarding the ball, reacting to passes, defensive box-outs, defensive rebounding, and quick and immediate full court offensive transition. For both groups, there is a certain level of physical conditioning in running full court sprints. 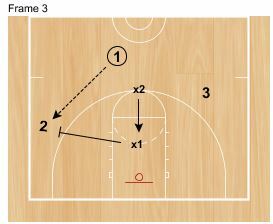 This drill is a unique way to break down techniques and concepts to both teach and review to all players concerning offensive and defensive basketball. Defensively, a coach must be able to teach and coach his players to prevent the opposing teams from getting any easy points. They must instill the philosophy “That if a team is going to score on us, they must have to work to earn those points!” Conversely, successful offensive teams are teams that know how and are able to score a few easy points in each and every game to counter the tough defenses that they will eventually face somewhere in their season. The drill allows for players to be able to run and jump and cut loose with a lot of energy. 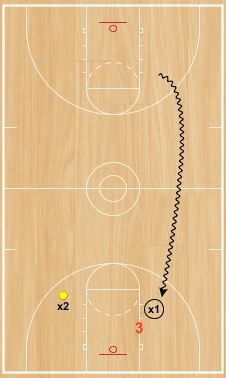 It can be a helpful conditioning drill, but also a motivational and inspirational way to start off a practice with all of the movement and structured freedom that can be incorporated into the drill. 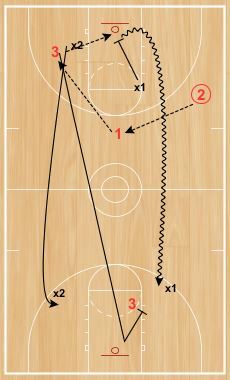 And as in all of the drills, it combines both offensive and defensive fundamentals and basics into the same fluid and time-efficient drill; making it an invaluable teaching and evaluating tool for coaches.